Rustic in appearance, this cigar is covered in a toothy, oily maduro wrapper, but offers a pleasant, medium-bodied smoke redolent of dried fruit, vanilla bean and toast. An excellent offering from the Fuente Family. For the price, Gran Reserva Cuban Corona Maduro is the ideal cigar for the everyday smoker. It is not too heavy and not too light. Milder than some Fuentes, but full of sweet spice, it will appeal to the most discerning tastes. Gran Reserva Cuban Corona Maduro is rustic in appearance. Due to its' magnificent construction, the Gran Reserva Cuban Corona Maduro has a very nice draw. 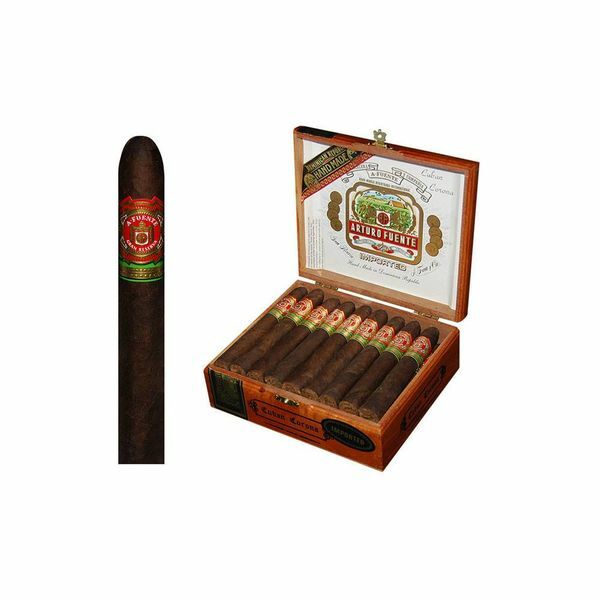 The hand rolled cigar consists of a tight Connecticut Broadleaf wrapper and Dominican filler and binder from the Fuente family’s private reserve. The medium-bodied smoke is abundant with flavors of vanilla bean, dried fruit, and buttery toast. The sweetness of the Gran Reserva Cuban Corona Maduro can be complimented with a tangy cocktail such as a margarita made with finer, smokier tequila. On my recent travel to Mexico, I hopped in to a cigar bar during a brief rain shower and imbibed in a unique margarita that worked well with the Cuban Corona afforded to me. Although I never got an official recipe, here is my take on a smoky margarita. Mezcal is a close cousin to tequila and has a distinctive smoky flavor due to the roasting of the hearts of agave plants underground before mashing, fermenting and distilling them. In a mixing glass, stir together 1 ounce of mezcal, 1 ounce of smoky blended Scotch (like the Black Grouse), and ¼ ounce of agave syrup (light agave dissolved in an equal amount of hot water). Juice of one lime.. Stir it all together thoroughly, and strain it into a rocks glass over fresh ice. Garnish with a twist of lime.